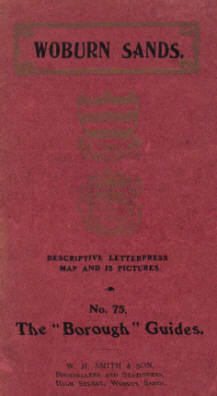 This Guidebook, c.1905, by Edward J. Burrow of Cheltenham, was sold by W. H. Smith, in Woburn Sands. My grateful thanks to Miss Parker for providing a copy. 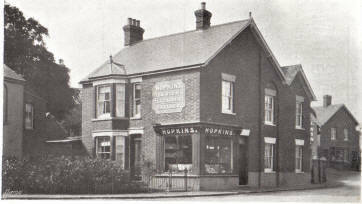 Although undated, the landlord mentioned as at The Swan was only there from 1903 – 1906, so it must date from between those years. 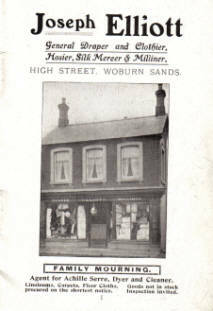 Woburn Sands. Early closing day – Wednesday. Introductory. 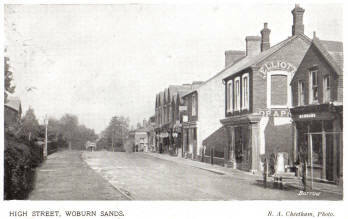 Long before the Railway had made the place more widely known, Woburn Sands was looked upon by coach-travellers as a welcome break in the long and tedious journey from London to the North. Passengers eagerly looked out for the pretty village beside the turnpike road where they knew full well that a warm welcome awaited them. The approach to Woburn Sands behind four good horses, must, in the summer time, have been an exhilarating ex­perience; and the arrival at the Swan Hotel, where the horses were changed, was the signal for bustle, excitement and good cheer. Visitors no longer arrive in this style, however, but obtain their first impressions of Woburn Sands as they emerge from the Station belonging to the Bletchley and Cambridge Branch of the London and North-Western Railway. The village is a comparatively modern health resort, situated 22 miles from its interesting neighbour, Woburn; 4 miles east of Bletchley, 12 from Bedford, 36 from Oxford, 42 from Cambridge, and 50 miles from London. 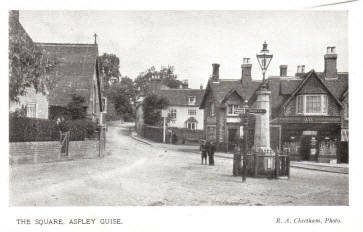 The Parish is partly in Buckinghamshire and partly in Bedfordshire, was formed in 1867, and comprises Aspley Heath and parts of the Parish of Aspley Guise and Wavendon. The village was formerly known by the delightful name of Hog Sty End – a designation calculated to keep those who did not already know its beauties, as far from the place as possible. 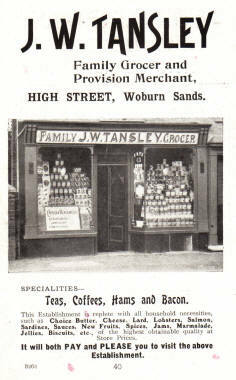 On the whole, the buildings at Woburn Sands are in very good taste, and the shops in the High Street are well-stocked to meet the demands of the people living in the villages close by, whose visits (when they don’t drive too hard bargains) are always welcome. 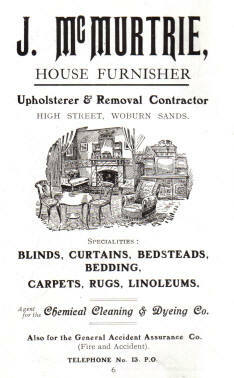 Saturday night is the time to obtain some idea of the business done here, the tradesmen having as much as they can do to cope with the demands of customers “from the provinces.” No stirring events of national importance have occurred at Woburn Sands, nor does its name appear in the annals of English history, yet we believe it is destined to grow in popularity with those suffering from tuberculosis, and other lung complaints, and with all who delight in a dry invigorating air, impregnated with those subtle remedial qualities put forth by firs, pines and other trees of the wood. The Institute. As the visitor passes down the High Street, he will notice the lofty public hall, known as “The Institute,” which was built by voluntary subscrip­tions and is admirably adapted and extensively used for public meetings, concerts, entertainments, etc. “On with the dance, let joy be unconfined,” is sometimes the language of those who use the splendidly-prepared floor for the practice of terpsichorean exercises. Two ante-rooms, and the usual offices complete this useful Institution, which will accommodate from two hundred to three hundred persons. The County Council Schools. At the bottom of Aspley Heath are the fine build­ings used as County Council Schools, where the children of the district learn their lessons in well-equipped rooms, and amid pleasant surroundings. Thanks to the generosity of the Duke of Bedford, the separate building used by the Infant School was erected a few years back. The Classical School on Aspley Heath is an excellent institution under the charge of the Ven. Archdeacon Miller and the Rev. F. F. Hort. The building is handsome, beautifully situated, and accommodates about 30 pupils. Being close to the woods, the pupils have some of the finest walks in the neighbourhood within easy reach. The Almshouses. The six well-built Almshouses in the Station Road were erected through the generosity of the late Mr. F. W. Down, and are highly appreciated by their inmates, who, besides having the advantage of living rent-free, are appointed 5s. weekly for their main­tenance. The Sanatorium for Consumptives. The climatic conditions in this district are all in favour of sufferers from chest and lung disorders. That patients might have the full benefit of this healing atmosphere, the Sanatorium on Aspley Heath was built on a spot 600 feet above the sea, and surrounded by pines and firs. This building, which will compare favourably with any similar Institution in the kingdom, was erected through the philanthropy of Mr. and Mrs. Bischoffsheim. Hotel and other Accommodation. 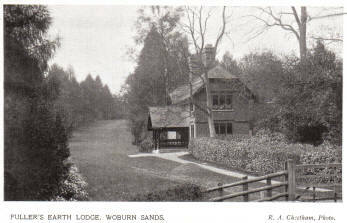 Woburn Sands is well-provided with comfortable Hotels, nearly all of which have excellent accommo­dation for cyclists. 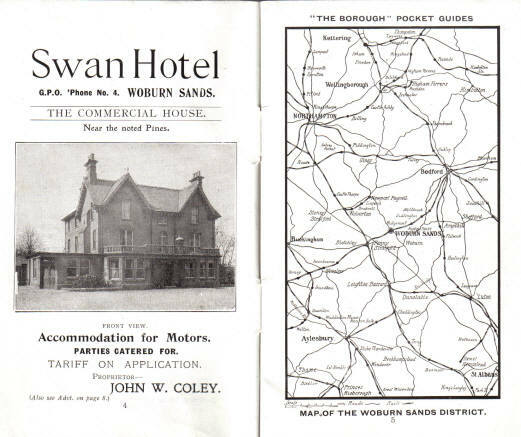 Among those most popular with tourists is the Swan Hotel, standing in an elevated position close to the Pine Woods belonging to the Duke of Bedford. Those who prefer private apartments will have no difficulty in procuring rooms at reasonable prices, either in Station Road, Hardwick Place and other parts of Woburn Sands, or at Aspley Guise. The people are uniformly courteous and obliging, and a most pleasant holiday may be spent here at a very moderate cost. Local Industries. No factory chimneys belching forth volumes of black smoke are to be seen at Woburn Sands, for the place does not depend upon any manufacture for its prosperity; but there are a few industries carried on, including brick-making, the preparation of a chemical dressing for wheat, a little lace-making and straw-plaiting, and the mining of Fullers’ Earth. Each of these is on a comparatively small scale, the inhabitants relying on the trade created by an increasing number of visitors, rather than upon any staple industry. The Parish Church. St. Michael’s Church at Woburn Sands stands in a very good position on Aspley Heath, and was consecrated by the Bishop of Ely on April 22nd, 1868. Its first Vicar was the Rev. Hay M. Erskine, and the gentleman occupying the office at present, is the Rev. Douglas W. Henry, M.A. 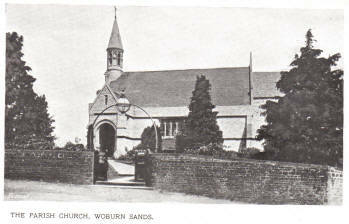 The Church was enlarged in 1889 by the addition of the North Transept, and the lengthening of the Chancel. The only objects of interest are the stained glass memorial windows and the handsome reredos. All sittings are free. Ordinary Sunday services at 11a.m. 3p.m. 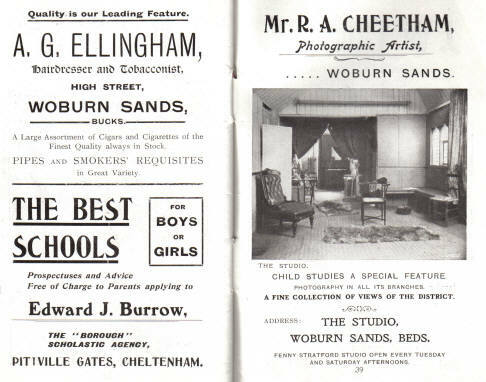 (Children’s Service) and 6.30p.m. The Friends’ Meeting House. 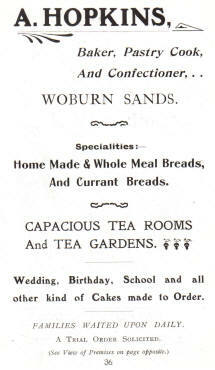 The history of the Society of Friends at Woburn Sands is an interesting one. Their old Meeting House (which was erected in 1675) has been super­seded by the present handsome building, opened in 1901. The new Meeting House cost £1,733, is free of debt, and will accommodate 400 people. Quaker services are held on Sunday mornings at 11a.m. and Evangelical services are conducted in the evenings. Adult Schools for men and women are connected with this place of worship besides other organi­zations. The most important Nonconformist Chapel in the town, is the Wesleyan Chapel, a large building in a commanding position in the High Street. The structure possesses much architectural merit externally, while the interior is commodious and attractive. Attached to the Chapel is a School­room of ample proportions. This building well exemplifies the importance of Wesleyan Methodism in the district, and has for a long time past contributed in a notable degree to the success which has attended this section of belief. Services are held on Sundays at 11a.m. and 6p.m. There is also a flourishing Sunday School and other Auxiliaries. 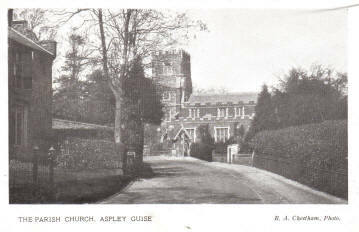 The Primitive Methodist Connection has a Chapel on Aspley Hill and the Calvinistic Baptist Chapel is in Theydon Avenue. and will agree with Byron that “There is a pleasure in the pathless woods,” especially if he happens to lose his way and gets late for breakfast. 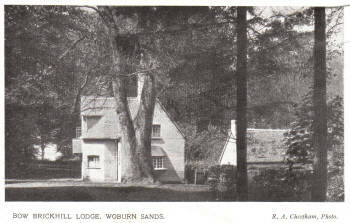 The old village of Bow Brickhill is reached by going past the “Fuller’s Earth Lodge” (a pretty house standing back on the right side of the road to Woburn) and the Church there should be visited on account of its great age and fine position at the top of the hill; and also because its old Choir formed the original of the famous picture called “The Village Choir,” by Sir David Wilkie. In later days the Manor became the property of the powerful Guise family (hence its name) and was eventually given to King Henry VIII. 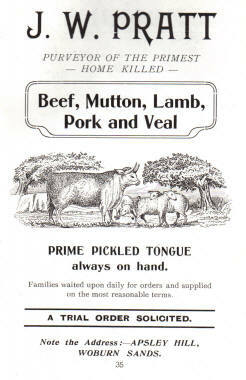 in exchange for lands in Gloucestershire. That monarch handed it over to Sir Ralph Sadlier, one of his favourites, and it has remained in the possession of the Sadlier family ever since. Besides the Classical School already mentioned, the other objects of interest in the village, from an architectural point of view, are the Parish Church and the Parish Hall; though some of the private houses (notably those at Woodside) are extremely handsome. The Parish Church is dedicated to St. Botolph and is within easy reach from the centre of the village. In this building the chief objects of note are the splendid stained-glass windows on the south side; the coloured lights in the clerestory; the beautifully carved pulpit; the handsome reredos, and the recumbent figure in the north aisle which represents Sir William Tyrynton, a powerful connection of the Guise family, who flourished in the reign of Richard II. The probable date of this monument is A.D. 1400. The other places of worship in the village are the Wesleyan Chapel (dated 1813, and situated at the foot of Mount Pleasant), and the useful Mission Hall near the centre of the village. The Parish Hall at Aspley was built in 1901, and cost about £1800, the expense being largely borne by His Grace the Duke of Bedford and other distin­guished benefactors. The Hall was opened by the Duchess of Bedford in 1902, and possesses a Reading Room, Parish Council Chamber, etc. 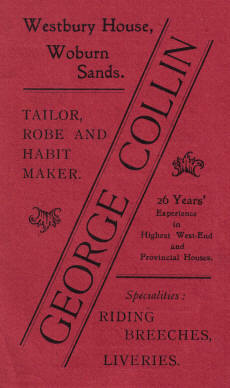 The Powage Press, Ltd., issue “Kemp’s Mercan­tile Gazette” from their Printing Works here, their premises occupying what was the Old Classical School. The Cricket Ground. Bedfordshire has not yet been included in the list of first-class counties, but it possesses many excellent cricket clubs; that at Aspley possessing a beauti­fully situated ground on the Common. Matches, more or less exciting, are played on Saturdays. If spectators are bored with the slow play, they are expected to admire the surrounding scenery, which, fortunately, is exceedingly beautiful. Wild Flowers. Visitors wishing to gather wild-flowers from the Duke of Bedford’s Woodlands, should obtain tickets at the Park Farm Office, and should do everything in their power to preserve plants, trees, and flowers from wanton injury or destruction. 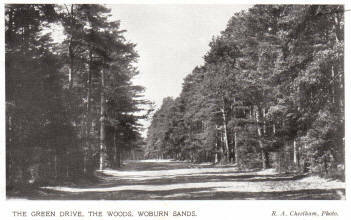 Woburn. Woburn is a pleasant town 2: miles south-east of Woburn Sands Station, and 13 miles from Bedford. It grew adjacent to a Cistercian Abbey founded in 1145 by Hugh de Bolbec, and was visited in 1572 by Queen Elizabeth. In 1595 it was almost wholly destroyed by fire, and suffered in the same way in the 18th century. 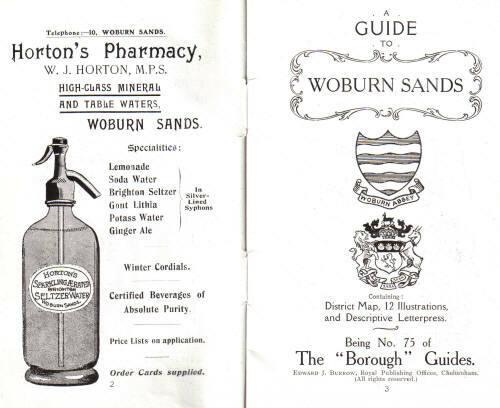 Woburn is now a clean well-built town consisting of good streets intersecting one another at right-angles, and its business houses are modern and up-to-date. The Old Church. In Bedford Street is the Church of St. Mary the Virgin, a building which was formerly connected with a church at Birchmore. Many repairs and alterations have been made – the tower being rebuilt in 1830, and the rest of the building pulled down in 1865; its materials being used in the erection of the Mortuary Chapel. The handsome tower contains a peal of 8 bells and a clock. The Cemetery surrounding the Chapel is well-laid out, and quite close to it are the Infant School, the Fire-engine House and the Old Parsonage – the last-named being used as a gymnasium. The New Church. This beautiful building will be found in Park Street, Bathstone was the material largely used in its erection, which was carried out at a cost of £35,000 – William, Duke of Bedford, bearing the expense – in 1865-8. 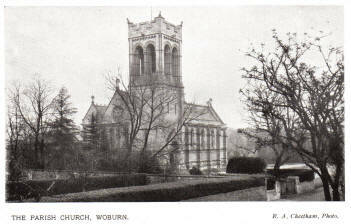 The stained memorial windows, the beautiful choir stalls, pulpit and organ gallery; the reredos, and the new organ, were all given by members of the noble family to whom Woburn owes so much. At one time the Church could boast a graceful spire, but as this was considered to be in a rather shaky condition, it was replaced by the present tower, which possesses a huge bell weighing 55 cwts. Vicar, the Rev. C. R. Dickinson, M.A. The Town Hall. The Town Hall in the centre of the town was erected in 1830, altered and renovated in 1884, and is now used for Petty Sessions and also for concerts and entertainments. The Hall ceiling is of stained pine, and there is a very fine fireplace. Other buildings worthy of note in the town are the Almshouses, at the north end of Bedford Street, the Congregational Church in Chapel Street (reached by a covered passage), the Wesleyan Chapel in Leighton Street, and the Institute and Reading Rooms (erected 1884) in the same thoroughfare. 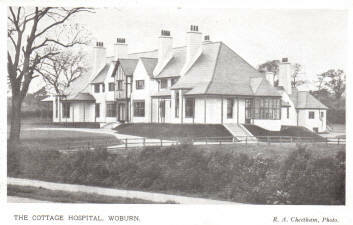 The Cottage Hospital. Only a few yards further on is the pleasant building known as the Cottage Hospital, built by the Duchess of Bedford in 1902-3 and fitted up with every modern convenience. This Institution accommodates 12 patients, with the attendants, and has already done a great deal of useful work. The annual exhibition connected with the Woburn Horticultural and Floral Society has for a goodly number of years been a very popular event in the town. The South Beds. Tennis Club has a capital ground on the Bedford Road, and the Town Club has head­quarters at the back of the Bedford Arms Hotel. 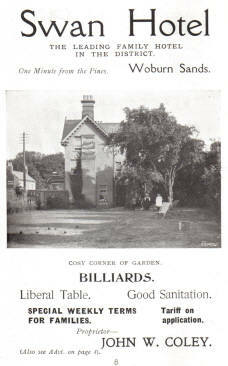 A good omnibus service connects the “Bedford Arms“ with Woburn Sands Station. Woburn Abbey. 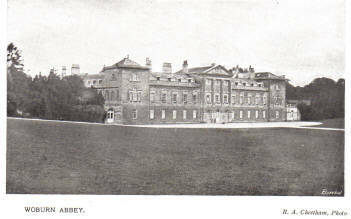 Woburn Abbey, the seat of the Duke of Bedford, in Woburn Parish, still retains its conventual name, although the ancient building has wholly disappeared. The Cistercian Monks to whom the old Abbey be­longed had a hard time of it in 1234, the community being partly broken up through poverty. The last Abbot, Robert Hobbs, refused to acknowledge the right of Henry VIII. to the monastic possessions, and rebelled against the authority of the King’s Commissioners. He was afterwards captured while bearing arms against the King, and hanged on an oak tree in full view of the place where he had formerly ministered. This tree is still standing and bears a tablet commemorating the event. The site and possessions of the Monastery were given to Lord John Russell, afterwards first Earl of Bedford (1550); and since 1570, the mansion has been the favourite residence of the Russell family. Most of the present buildings were erected about 1744, by John, fourth Duke of Bedford. The structure is built of Tatternhoe stone in the Italian style, and is quadrangular in shape. The West, or principal front is 272 feet in length, and among the numerous apartments of the mansion are the Saloon, 352 feet by 25½ feet; the Library, 50 feet by 242 feet ; and the Picture Gallery, 1112 feet by 17¾ feet. The North Corridor, 170 feet in length is filled with bronzes, plaster casts and vases; and the South Corridor (same length) contains some beautiful drawings in red chalk after Raphael, and an inter­esting series of models of English cattle. The mansion contains a very rich collection of paintings and sculpture, besides other works of Art; and its State Apartments display a wealth of furnishing and decoration. Woburn Park. Woburn Park is nearly 3,000 acres in extent and may be reached either by the ornamental gates on the London side of the town, or by the entrance in Park Street close to the Church. The Park is mag­nificently wooded, containing many fine oaks, elms, cedars, firs and pines. There are splendid lakes, enclosures for different varieties of wild animals (including camels, buffaloes, gnus and giraffes), special kinds of deer, llamas, zebras, Indian cattle and wild horses. Innumerable wildfowl disport themselves on the lakes, where herons and black swans may also be seen. Nearly opposite the estate Offices is the Town Cricket Ground, which is gener­ously kept in splendid condition by the Duke, who, together with her Grace, takes a not unnatural pride in promoting the welfare of all who have any­thing to do with this magnificent estate. Places of Interest in the Neighbourhood. Bedford. Bedford, with its memories of Bunyan, is only 12 miles away. The cycle run is a good one, and much pleasant time may be spent in the old town. It is a pretty place, and the river affords ample oppor­tunities for excursions either by rowing-boat or steamer. The views from the iron bridge are very beautiful, especially the broad, straight expanse of gleaming water which stretches as far as the Old Bridge. Alongside the river is a well laid out Promenade, plentifully provided with seats, and planted with turf and shrubs. This forms a fashionable parade on Sunday mornings after service. Many of Bedford’s streets are charmingly planted on either side with trees, notably De Pary’s Avenue, Bushmead Avenue and Foster Hill Road. Close to the Cemetery at the top of the last-named thoroughfare, is the beautiful Park, where cricket matches are played on Saturday and Wednesday afternoons; and older inhabitants enjoy a quiet stroll along the many lovely walks. The grounds are tastefully planted with flowers and shrubs. Cycling is allowed on the principal paths. Another popular pleasure ground is Russell Park, close by the river, where a wide stretch of grass land is used for hockey, cricket, and other games, while at the far end, a number of swings are provided. This space is bordered by pleasant gravel paths, on either side of which are planted neatly arranged trees and flowering shrubs. One of the first sights the visitor to Bedford makes for, however, is the famous statue of John Bunyan, at St. Peter’s Green (turn to left on reaching High Street from station), which merits more than a passing glance, is a splendid work of art, the attitude, expression and dress being admirably executed. The panels inserted in the pedestal on which the statue stands are also very fine. They illustrate scenes from the “Pilgrim’s Progress,” and under­neath the one representing Christian’s combat with Apollyon, an inscription informs us that the statue was presented to the Borough of Bedford by Hastings, IX. Duke of Bedford, on June 10th, 1874, in the mayoralty of George Hurst, Esq. The unveiling ceremony was witnessed by thousands of people, including many eminent Americans. Turning back down the High Street, we come presently to the statue of John Howard, the Philanthropist, which stands on the right, in the open space used on Satur­day nights as a Market Square. A turning on the left from the High Street, just before the statue is reached, is called Mill Street, and contains three of the most important Nonconformist places of worship in the town, including the celebrated Bunyan Meeting House, so long associated with the ministry of Dr. John Brown. The Chapel is reached through some very fine gates, and has a handsome and spacious interior. Bunyan’s chair and other relics may be inspected here. A little beyond “Bunyan’s Meeting,” as it is familiarly called, is St. Cuthbert’s Church, and by turning to the right, we reach the Embankment, and passing along it soon come to the Old Bridge, on which the gaol in which Bunyan was confined once stood. The Bridge forms a link between the High Street and the road which we take for Elstow. Just beyond it on the right is a pretty Public Garden running down to the water’s edge – a pleasant spot for a quiet read or a talk with a lady friend. Con­tinuing our journey, we make for Elstow, passing over the London and North-Western Railway Bridge and then turning to the right. The village is about a mile from Bedford, and the road is a fairly good one. Bunyan’s Cottage lies on the right as we enter the village. Picture post-cards of the Cottage, the Church and the old Moot Hall where the famous preacher used to hold meetings, are to be bought here. There is much to kindle the imagination at Elstow – the Green remains practically in the same condition as when Bunyan played thereon; the old Gaol gates are preserved under the tower of the old Church, and the bells which John thought were coming down on his head, still hang in their place. We may return into Bedford by the Ampthill road, passing the Hospital (on the right) and the celebrated Howard Engineering Works (left) on our way. No description of Bedford would be complete without mention being made of her two most important Churches – St. Peter’s, close to the Green bearing the same name, and St. Paul’s, just off the High Street, and looking down Commercial Road. The latter possesses a beautiful spire, and its melodious chimes are among the most familiar sounds with which the townsfolk are acquainted. The prosperity of the town is closely bound up with that of its fine Public Schools, which have won a world-wide reputation for efficiency and moderate fees. Chief among these are the Grammar School (standing in extensive playing-fields off De Pary’s Avenue and equipped with fine laboratories and workshops); the Modern School, nearly opposite St. Paul’s Church in Harpur Street; the County School, just outside the town, the Crescent House Ladies’ College, in Bromham Road; the Howard Ladies’ College, also in Bromham Road; the Bedford Ladies’ College, in Conduit Street; the Girls’ Modern School, and the Bedford High School for Girls. The roads round Bedford are fairly level and of good surface, and such picturesque villages as Stevington, Goldington, Wilshampsted, Cotton End, Cardington, Southill, Penhold and Wootton will well repay a visit. Ampthill is a pleasant little town, overlooked by hills, and has a station on the Midland main line. The approach to it by road from Bedford (7 miles) involves climbing a terribly stiff hill just before the town is reached. The views obtained from this hill are splendid. The Parish Church at Ampthill contains a mural monument to Governor Nicholl, who fell in the sea-fight off Solebay in 1672. 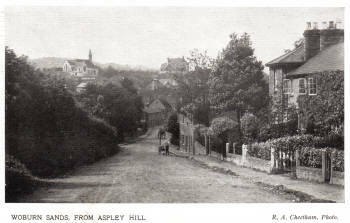 Ampthill Park adjoins the town on the N.W. and is united to Houghton Park on the N.E. It is now the property of the Duke of Bedford. A Castle was built on it in the time of Henry VI., which was for some time the residence of Catherine of Arragon, first Queen of Henry VIII. The present mansion stands on lower ground than the site of the old Castle, and commands an extensive view of the Vale of Bedford. It is a magnificent edifice, was built by Lord Ashburnham, and contains valuable paintings and a Museum. The Park is spacious and contains many venerable oaks. Houghton Park is interesting because it possesses the pear-tree under which Sir Philip Sidney is said to have written part of his “Arcadia.” The remains of the house built by “Sidney’s sister, Pembroke’s mother” are also to be seen here. A beautiful alcove of lime trees, called the Alameda, was planted by Lord Holland, for the recreation of the towns­people. This beautiful village stands about a mile from its station on the Bedford and Bletchley Branch of the 1 London and North-Western Railway, and 2J miles north-east of Woburn. The walk from the station is a delightful one, as also is the cycle run from Woburn, the woods being magnificent in places. Dunstable, a town lying almost due south of Woburn Sands, and famous for its manufacture of straw hats, felt hats and bonnets, is also worthy of a visit. Several interesting ruins are close by, including remains of a British Camp, about 12 miles away, and Totternhoe Castle, a short distance further on. The ruins of a Monastery of Black Friars are also to be seen in the town. The busy town of Luton is on the Midland main line which runs through Bedford to St. Pancras, and is the most important centre of the straw plaiting industry in the kingdom, its goods being sent to all parts of the world. The manufacture was origi­nated in the reign of James I., and although at one time it seemed as though the trade would be removed to Dunstable, the town has succeeded in winning the foremost place. The principal public buildings at Luton are the Town Hall, the Corn Exchange, the Plait Hall and the Court House. There are also a fine Public Library, a beautiful Park, extensive recreation grounds and large, swimming baths, so that the physical well-being of the people is well looked after by an enterprising Corporation.